Put one of these in front of your amp for excellent flexibility. Practical. Versatile. Well-made. Great tones. The ParaDrive from US effects-maker Homebrew offers two related functions - overdrive and boost - independently in one box, each with its own footswitch. 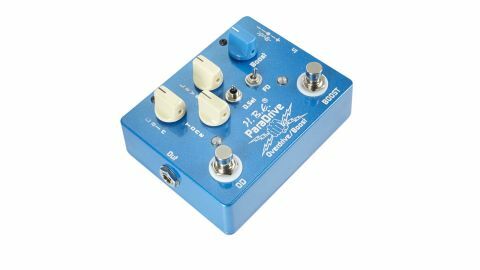 "One of the most versatile and practical overdrive pedals we've seen lately"
The overdrive is based on the HBE Power Screamer, itself derived from a Tube Screamer-style JRC4558D circuit, and has a three-way 'diode select' switch for tonal options, plus a 'fat drive' switch for extra low-end gain. The boost section offers a gain increase, dialled in with a single knob. One position of the diode switch offers classic TS tone, although the ParaDrive has more up its sleeve than a standard Tube Screamer in terms of output level. The other two offer variations with more low-end, gain and dirt - useful choices to better match your amp. The boost takes the overdrive to another level, but it's great on its own - just kicking your amp up a notch. One of the most versatile and practical overdrive pedals we've seen lately. It's like adding three extra channels, giving you four level/dirt options.